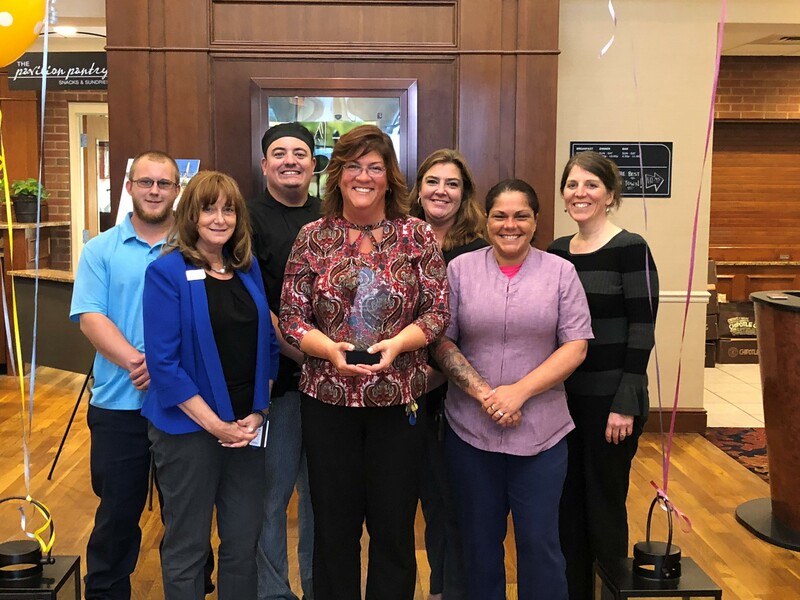 WILTON, NH – Roedel Companies announced Brenda Edwards as its annual Values in Action award winner during a surprise property blitz, Tuesday, October 2 at the Hilton Garden Inn Manchester Downtown. Edwards was presented the award by the Roedel Executive and Leadership Teams surrounded by her entire hotel staff. Edwards is the General Manager at Hilton Garden Inn Manchester Downtown in Manchester, N.H., and was one of 40 people nominated from the eleven properties owned by Roedel Companies. Edwards was recognized for her above and beyond approach to everything that she touches, from mentoring other General Managers, to being a pillar in her community, to setting forth tremendous examples to her staff and peers. Edwards was nominated by each member of the leadership team at her hotel, amongst others. She has been a part of the HGI MHT leadership since it opened in 2006. Edwards resides in Weare, NH with her husband, Curtis and two children, Grady and Emma.